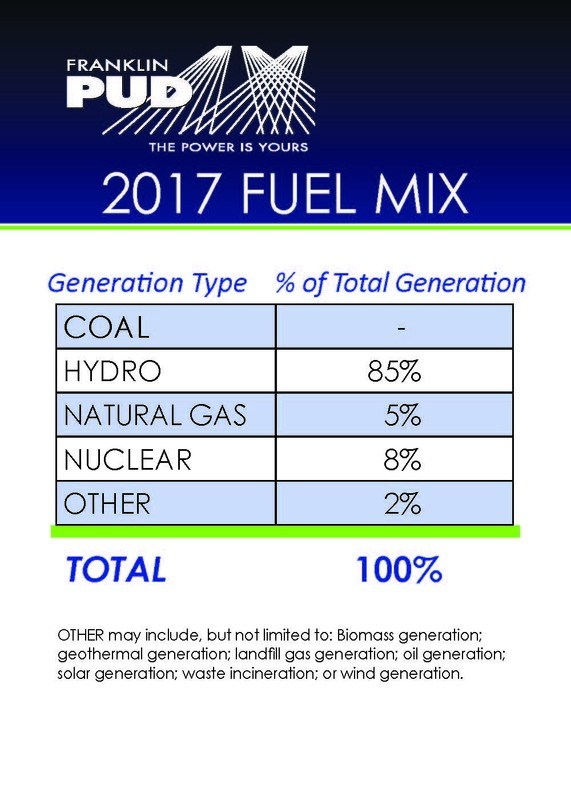 Each year Franklin PUD, along with all other electric utilities in Washington State, is required to publish a fuel mix report identifying the types of generation used to supply the electricity we provide to our customers. As you can see on the chart below, the majority of the electricity Franklin PUD purchased for our customers in 2017 was renewable energy, hydropower generated from dams along the Snake and Columbia Rivers. Please note: The chart below reflects an assumption by the Washington State Department of Commerce that utilities' short-term market purchase are from the "Northwest Power Pool (NWPP) Net System Mix", a potpourri of all generation throughout the NWPP region. The NWPP is comprised of all or major portions of the states of Washington, Oregon, Idaho, Wyoming, Montana, Nevada, and Utah, a small portion of Northern California, and the Canadian provinces of British Columbia and Alberta. The NWPP System Mix includes hydro, natural gas, nuclear, coal and very small amounts of other types of resources. We are required by state law to provide these numbers to you.